Yesterday morning a seemingly innocuous Kanye West tweet had Marvel fans comparing the artist to Avengers: Infinity War villain Thanos. Turns out using the word "balance" while being in a position of power and influence will do that these days. 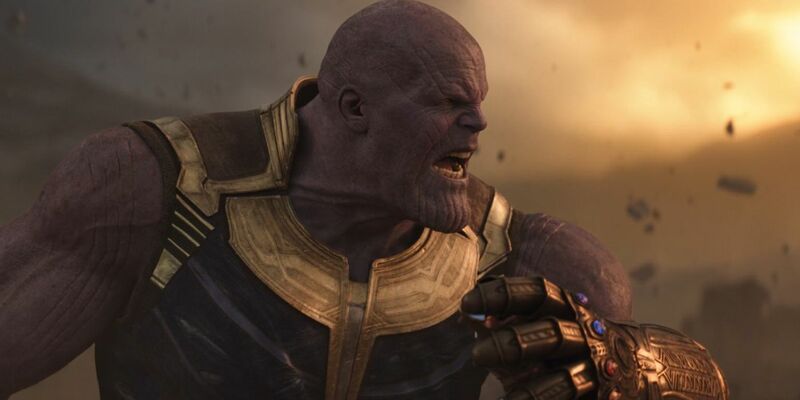 In Avengers: Infinity War, Thanos' mission to murder half the population of the universe was born out of his desire to restore balance. Having grown up on Titan, a planet essentially ravaged by overpopulation, Thanos believed that by eliminating 50% of all life those spared would free up enough resources for everyone else to prosper. Despite the many, many things wrong with this plan, he succeeded and Infinity War ended with a host of beloved characters disintegrating into nothingness. Luckily, Nick Fury had the presence of mind to use his last seconds to beep Captain Marvel, so all is not lost and, hopefully, Avengers 4 will feature more than its fair share of resurrections, at least for the mainstay heroes. If you're one of the 28 million people that follow West on Twitter, you're no doubt familiar with his periodic proclamations. It makes sense, he only follows eight people, so he's using it as an outbox for ideas. A cursory glance at the previous week's tweets reveals other bits of unsolicited cultural advice, so his tweeting about culture being about balance doesn't feel nearly as related to a comic book supervillain as the subtweets would have people believe. That's not to say Kanye and Thanos don't actually share some of the same qualities. They're both men of incredible ambition and hubris, neither cares too much about public opinion - at least when it comes to the execution of their life's work and they both have children they've publicly doted on. Taking all that into context, it's doubtful West would use the powers of the Infinity Stones for evil if they existed, but he may not be the first person of choice to wield those Stones if it ever came to that. This entry was posted by Screen Rant on September 15, 2018 at 12:09 pm, and is filed under TV News. Follow any responses to this post through RSS 2.0. You can skip to the end and leave a response. Pinging is currently not allowed.